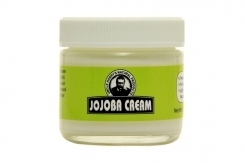 Jojoba oil is an excellent all-over moisturizer for both hair and body. Its gentle nature allows frequent use for many skin types and is a compatible carrier oil. Organic cold pressed golden jojoba oil (Simmondsia chinensis). Use directly on skin to nourish and moisturize. It can also be used as a massage oil, bath oil, hair oil, or perfume carrier. Product Label Ingredients: Organic cold pressed golden jojoba oil (Simmondsia chinensis).